According to the United Nations, the world’s population crossed the 7,000,000,000 mark on October 31, 2011. That seems rather appropriate since “The Day of 7 Billion,” as it is known, absolutely horrifies me. Each day – we are talking each day, folks – the number of humans on the earth grows by more than 221,000. This is not just births; this is births less deaths. And because the population grows at an exponential rate, the per day growth rate edges up each day. In 1960, the world population was estimated at 3 billion. We hit the 6 billion mark in 1999. Let’s break that down a bit: from all of antiquity up to 1960 to attain a population of 3 billion and then just another 39 years to double it. In 1999, the United Nations estimated that we would reach the 7 billion mark in 2013. Humans, being the overachievers that we are, met this troublesome milestone two years early. And here is the scary part: since the turn of the new millennium, we have been told that we are much more aware of the impact of unchecked population growth and we are much more proactive with respect to woman’s health needs; we have been told how fertility rates are declining and how the use of contraception has reached the developing world. I don’t see it. We went from 6 billion to 7 billion in 12 years. That’s a growth rate of 1.3%. It’s lower than it was in the 60′s, but it’s still too high. The United Nations Population Division surely can see that the data plots an ever-decreasing interval for each successive billion in growth up to 1999. What possible factor could they have considered to account for a sudden reversal in the trend line? For the UN’s numbers to work, as the population reaches 8 and 9 billion, the growth rate will need to slow to less than 1% – a rate we have not even sniffed. And the UN projection of reaching 10 billion in 2183 is ludicrous. That would require a growth rate of a mere .082% (not .82%, .082%) over that 129 years. Who reviewed this document? 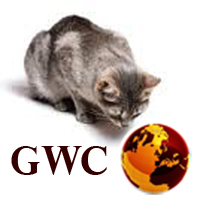 Assuming that there are no cataclysmic events, Global Watch Cat is betting the house that the 10 billion mark will be attained by 2050 – that would still require 38 years of less than a 1% growth rate, a ratio we have well-exceeded for the last 4 billion souls.